Well now, this site has gotten a little dusty, eh? I still have photos to post from May, but I have not been out on the water since then, until this past weekend. It was a busy summer, and gas prices kept my travelling rather sparse. It was tough to read updates and see photos on Facebook of friends who were getting out all season. I was afraid I was not going to make it out again. Luckily, a friend offered to treat me for a trip for my birthday so I have been able to squeeze in one more, possibly last, trip for the 2012 season. This friend and two others joined me for the excursion, a first whale watch for all of them. I was delighted to take them out but I always get a little worried that we won’t have a good trip and it will disappoint the newbies. I needn’t have thought much about it. We went out from the New England Aquarium because their schedule fit better for events happening later in our day. Sadly, I don’t think I will get to Gloucester once this year, which is just wrong! We had a beautiful day to be out on the water, and lots of other people thought so, too. Once again, we were on a fairly crowded boat but it was mostly ok. Everyone seemed to be able to get to the rail. I do still wish that the company which runs these trips (which, as I understand it, is not the Aquarium itself) didn’t load the boat quite so full. Took us a while, and a ride pretty much due east from Boston Harbor, to reach any activity out on Stellwagen Bank. We wound up around the northeast corner. The horizon was dotted with some fishing and pleasure boats, but no blows could be seen. And then, suddenly, there was a splashing nearby. Etch-A-Sketch had popped up with some tail breaching and lob tailing. We got a fairly close look at her while she was being active, close enough also to see the satellite tag still on her left side beneath the dorsal (observed in May, too). 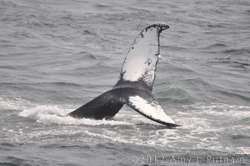 As she was being active, a couple of other humpbacks moved into the area, Nile and Valley. They were mostly logging and doing shallow dives, but we got some good looks at the dorsals and flukes. As we were preparing to head back into Boston, a third humpback joined Nile’s and Valley’s association, but we were not able to stick around long enough to see its flukes. I can say is it was a smaller humpback, but not much else. Did get a dorsal fin shot. Got a few photos, which are posted in the gallery. My friends and I had a terrific visit and a nice day on the water. I was also delighted that our naturalist on the trip, Heidi, seemed to be very experienced. I find it to be hit or miss on the Aquarium trips as to whether or not you get someone who really works in and is well versed in the field and animals, so this was a nice bonus. Maybe I will get lucky and squeeze in one more trip. If not, the winter will be about saving up and planning for many more trips in 2013. Six trips are not nearly enough, especially months apart!